Few companies would discourage salespeople from making sales calls, even when sales effort reaches the point of diminishing returns. But that’s exactly the right thing to do, when incremental activity no longer correlates with incremental sales. Response curves help management determine how many sales calls – or other sorts of selling activity – will optimize results. Register now and learn how to optimize sales call plans and maximize results. In today’s business environment, very often the mandate is to “do more with less” – less staff, less resources, less time. For the sales force, the push is to bring in more customers, keep the ones we have happy, and do it at a minimal cost to the organization. TerrAlign understands these challenges. Our sophisticated approach to sales call planning and optimization is engineered to streamline processes, maximize opportunities and empower organizations to get better results with less. Contact us today to learn how strategic sales call planning can boost your sales team’s performance. Managing sales call plans can be a difficult task. Many organizations use spreadsheets and homegrown systems that are disorganized, time-consuming and inefficient. With TerrAlign’s sales resource optimization solutions, there is a better way. Independent research conducted by TechValidate illustrates the experience of one Large Enterprise Professional Services Company that chose TerrAlign over competitive platforms for its strategic approach to resource optimization and Salesforce integration capabilities. With TerrAlign, the company has streamlined sales call planning and realized positive changes to sales headcount and revenues. Read the case study and learn how your company can improve sales call planning and quickly increase revenues with TerrAlign’s sales resource optimization solutions. 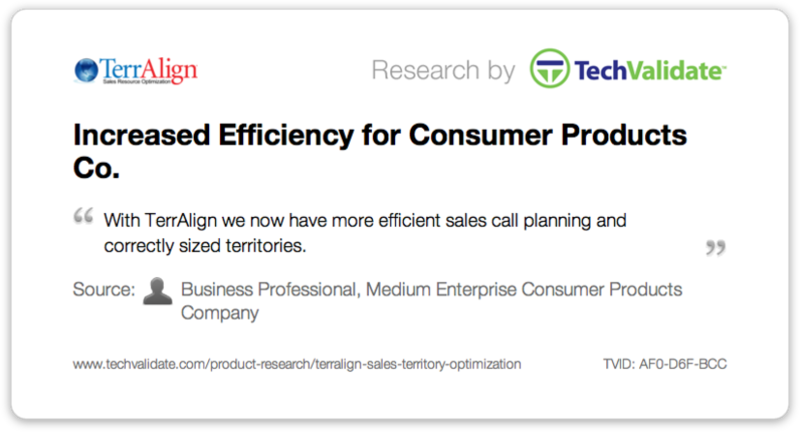 TechValidate recently surveyed TerrAlign customers and found that improved sales call planning and sales territory sizing were among the top benefits realized through the use of TerrAlign’s Sales Force Effectiveness Consulting Services. Learn how your company can improve sales call planning and sales territory sizing with TerrAlign. You are currently browsing the archives for the Sales Call Planning category.